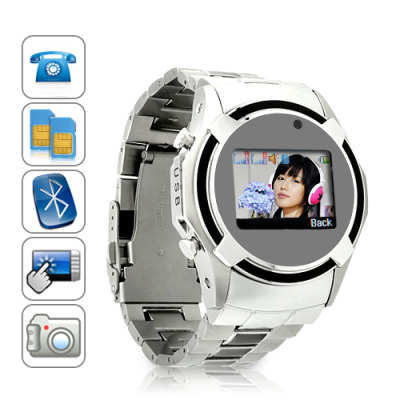 Successfully Added Dual SIM Cell Phone Watch (Quadband, Touchscreen) to your Shopping Cart. Introducing our first Dual SIM Cell Phone Watch, meet the high-tech mobile communications device that fits on your wrist and instantly merges contacts from up to two SIM cards! Finally, reaching your business SIM contacts and personal SIM contacts is now easier than ever and available in watch phone form! This stylish Dual SIM Touch Screen Cell Phone Watch allows you to to wear your cell phone on your wrist just like a normal watch! With its durable stainless steel finish and many hi-tech features (including MP3 player, video player, built-in camera, and more) you have a handy communications device that works as well as it looks and literally puts the world at your fingertips! Unique to our amazing line of watch phones, this Touchscreen Cell Phone Watch comes with convenient Dual SIM and Dual Standby features! Never before seen on a watch phone, having dual SIM card slots is perfect for those who want to keep two active phone numbers (personal and business) inside one convenient device. This amazing cell phone watch is sure to sell out quick so buy one for yourself right away and then let your online customers in on the secret too. Brought to you by the leader in wholesale direct from China electronics - Chinavasion. Come with E-book, Alarm, Calendar, To-Do List, Image Viewer, User Profile Manager, WAP, GPRS, World clock, Audio / Video player, more! but the Bluetooth range is crap, only less than a meter. on 2011-07-31 12:10:22 SO EXCITING TO BE A TREND SETTER!!!!! I love my watch phone...people are going nuts here for one...and ill be ordering way more...I am the first one to have one activated here in my home town in Cornwall, ON CA and they have no Idea what will hit them...I had 2 sold in 12 hours and 10 drooling for me to order more!....lol...thnx China ision....your my bridge to success! on 2010-11-15 22:13:45 Rapidez y seriedad, bateria[CVSL-M165] poca duracion.